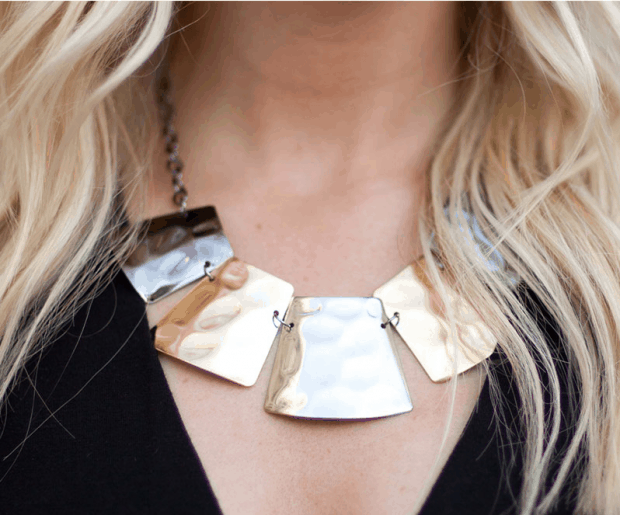 Beautiful Metallic Mayhem Necklace & Matching Earrings Just $5 Plus Shipping! You are here: Home / Great Deals / Beautiful Metallic Mayhem Necklace & Matching Earrings Just $5 Plus Shipping! You can get this beautiful Metallic Mayhem necklace and matching earrings for just $5 plus shipping! Any additional pieces you add to your order are just $5, too, and FREE shipping for the additional pieces! All necklaces come with a FREE matching pair of earrings, too! Curved silver, gold and gunmetal plates are impressioned with large divoted textures that add shimmering metallic detail that creates a fearless statement piece. Features an adjustable clasp closure. Find more $5 pieces here!